I am so excited to share our gender reveal party! It was such a beautiful day and everyone had so much fun. The weather even cooperated (sorta). It wasn't 100 billion degrees and we weren't hit with a giant downpour either. The only casualties were the balloon stands. The wind was just too much for them. Ok seriously though, enough about the weather. When my friend Jen said she wanted to throw me a gender reveal party I was touched. I love throwing parties for people, so it was super sweet that someone wanted to do something for me! We discussed a few things regarding colors and the "big reveal". I wanted something a little unconventional (since gender parties are now a conventional thing these days haha). Jen did a great job with the colors. She had pink and blue (obviously) but mixed in a lot of yellow and green too. The invites were absolutely adorable and when the time came for the party, everything matched perfectly. As the guests came in, they were encouraged to grab either a pink or a blue necklace depending on what they thought I was carrying. Next to the necklaces was a picture frame that guests could write a little message on. 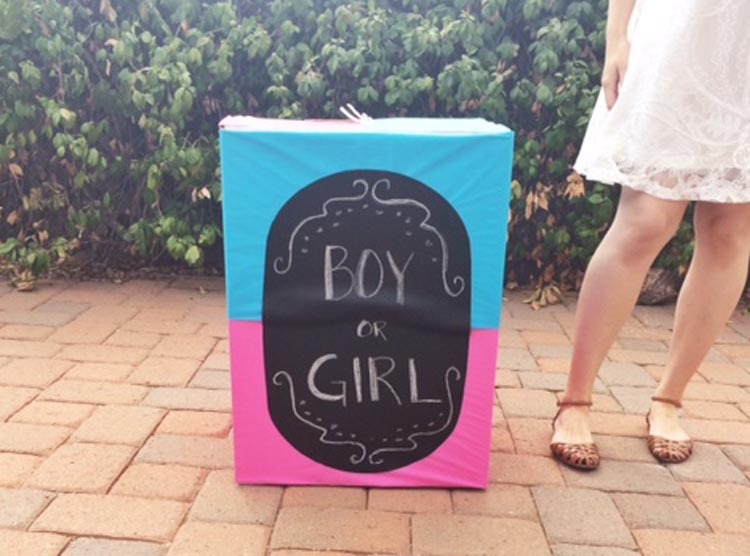 Most people waited until after the gender had been revealed so that they could address the message accordingly! We had a huge spread of food (which made this prego lady super happy)! Jen's husband, Ross grilled up hamburgers and hotdogs for the whole party. Everything was delicious. Jen had asked me if I wanted games or not and I told her that either way was fine. Spending time with friends and family is always enough. Also, I had no idea what kind of games you would play at a gender reveal party. But Jen and my friend Kate (who also helped with this fabulous shindig) found one! So after everyone had finished eating we headed outside for the game. Everyone was given both a pink bow and a blue tie on a stick. Then Kate would read an old wives tale about pregnancy (for example "moodiness means boy or girl?") and the guests would either raise the pink bow or the blue tie to signify what they thought. Then Kate would reveal what it "usually" meant and then I'd say if it signifies boy or girl for myself. Andrew tallied up points boy vs. girl and in the end it was a tie! So the game didn't even indicate one way or another haha. Finally it was time for the big reveal! As a family we untied the box and lo and behold....Pink and red balloons flew out! Baby girl!!! After that, we hugged family and friends, took lots of pictures and then stuffed ourselves with delicious cupcakes. The party slowly came to an end but the happiness Andrew and I were feeling was there to stay. Instead of cards and gifts, Kate and Jen asked people to bring children's books with a message inside. So when we left, we not only took some great memories but also some awesome books, which is always a win in my opinion. And if there wasn't enough already, here are a few more pics from my phone. Andrew is the first "girl Dad". Peter kept trying eat the bows and ties like they were lollipops. He was disappointed every time. The lovely ladies who planned this whole party! My sisters are really excited for a niece! I am so thankful to have such close family and friends. I don't say this often or throw it around lightly... but our family is truly blessed.